Governor Cuomo announced the opening of a newly expanded facility for Autronic Plastics, an injection molding company in Suffolk County that will create 21 new jobs and support 106 existing jobs. Autronic Plastics' new corporate headquarters in Central Islip. Photo by: Autronic Plastics, Inc.
Central Islip, NY - October 13, 2015 - Governor Cuomo announced the opening of a newly expanded facility for Autronic Plastics, an injection molding company in Suffolk County that will create 21 new jobs and support 106 existing jobs. Through the Governor's ReCharge NY program, the firm is receiving 436 kilowatts of low-cost electricity from the New York Power Authority in exchange for its commitment to job support and about $4 million in capital investments. “We are committed to helping companies grow and expand on Long Island and across New York and through providing low-cost electricity, we are seeing businesses create jobs and plant deeper roots in local communities." Governor Cuomo said. "These investments have a great impact across the entire state and will help ensure that we continue to move forward." 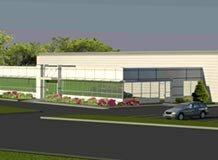 Autronic Plastics had operated in Westbury, Nassau County, for 50 years and has now moved its operations to Central Islip. Its 100,000 square-foot facility is optimized for injection molding, tool making, product assembly, and design engineering. The firm was awarded ReCharge NY power in July 2013. Video of the firm’s new facility on Long Island is here. Governor Cuomo launched ReCharge NY in 2011 to help businesses and not-for-profit organizations lower their operating costs and spur economic development. The program offers up to seven-year contracts for lower-cost power. Half of the power under the program—455 MW—is from the New York Power Authority’s Niagara and St. Lawrence-Franklin D. Roosevelt hydroelectric power plants, which provide some of the lowest-cost electricity in the state. The remaining 455 MW is economical power bought by the New York Power Authority on the wholesale market. The Governor’s program has provided more than 778 megawatts to 679 business operations and 72 nonprofit organizations over the last two-and-a-half years. (One megawatt is enough power to meet the needs of 800 to 1,000 typical homes). In addition to the power incentives, Autronic Plastics has received $1 million over the last five years from the New York State Energy Research and Development Authority to develop cutting-edge energy efficiency technology for use in subway platform lighting, a subway tunnel maintenance lighting system and lighting for construction sites. “LED lights use about a sixth of the energy of incandescent lights, so Autronic Plastics’ work has tremendous potential for energy savings. Under Governor Cuomo’s Reforming the Energy Vision, the state’s investment in the development of new, more efficient clean energy technologies is helping to create an energy system that is cleaner, more resilient and more affordable,” John B. Rhodes, New York State Energy Research and Development Authority President and CEO said. The New York Power Authority is currently using Autronic Plastics technology in a project with the Metropolitan Transportation Authority to install portable subway lighting in the New York subway system. Senator Thomas D. Croci said, "I'm so pleased to have Autronics in Central Islip. ReCharge NY is one of the ways we can address the high cost of doing business on Long Island and promote new job growth for our region." Islip Town Supervisor Angie Carpenter said, "Expanding jobs and improving the economic climate in Islip Town is a top priority of my administration. And ReCharge NY is the right program to encourage more companies to stay here, lower their energy costs and add to the vitality of our communities." Subject: LongIsland.com - Your Name sent you Article details of "Governor Cuomo Announces Opening of New Autronic Plastics Facility in Suffolk County"